Food Served from open to close. Ropes Course hours may vary. 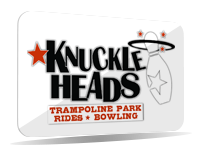 Want to be kept up-to-date on the latest Knuckleheads news, special offers and exclusive coupons? Then sign up here and you’ll be in the club and in the know!